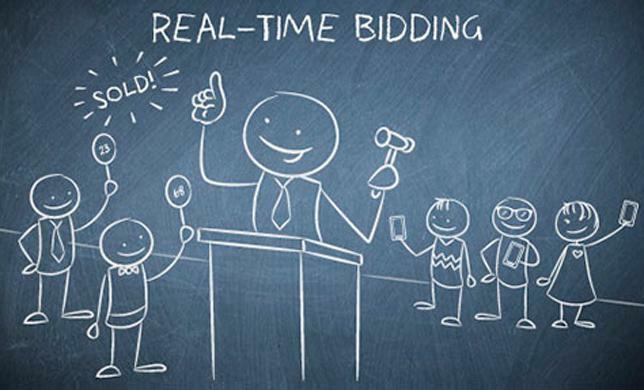 Real Time Bidding (RTB) was first introduced to the online ad industry back in 2009. The aim was to create a more targeted way to advertise digital display ads (CPC, CPM). Advertisers are asked to bid for certain premium ad inventories supplied by publishers via ad networks, who act like a kind of stock exchange. Various advertisers offer different prices for the ad spots and the highest bid wins the space or the first impressions on the publishers channel. These auctions take place in the milliseconds it takes before a page loads – that’s what makes it real time! B wins the bid and therefore he pays $1.60 for the ad space for 1,000 impressions. B wins the bid and therefore he pays $1.53 for the ad space for 1,000 impressions. This system allows you to save time and guarantees you the best spot at the lowest price. The advantages of RTB benefit both publishers and advertisers. Publishers obtain higher revenues on their inventory by opening up that inventory to a buying market designed to maximize the value of each individual impression. Advertisers get enhanced consumer targeting capabilities and premium ad placements meaning their ad spend goes further as they are not wasting budget on poorly-targeted impressions. Here are 7 tips on how to control, manage and maintain your RTB campaigns. Unless you have already identified the website that you want to bid on I recommend that you first run some campaigns on an ad network with the RON (run of network) selection. This initial test will reveal to you which sites will perform/convert better. Now go and study that website as there must be a reason why you are converting better on that site. Maybe its content is perfectly suited to the product you are advertising or it is being constantly updated with fresh content that is driving regular traffic to the site. Although the Alexa ranking is important, if you have a niche product the content on the site will be much more important to you because you will obtain quality traffic leading to better conversions. So how do you ensure that you have the data in front of you to take you to the next stage which is analysing what to bid on? You need to implement a conversion tracking system like a tracking pixel. Think of the pixel as a cookie that the ad network’s system can use to give you the metrics you need to analyse and track how your campaign is going. Tracking will allow you to measure as well as predict the ROI and lifetime value of a customer and also allow you to re-target users. In an active, dynamic environment where the competition is very aggressive the key to stay on top is to analyse the information available to you. On ExoClick’s Campaign page for example you can analyse all the necessary metrics to check your goals (conversions) utilise clicks, CTR, impressions and the eCPA to see if your campaign is making money. That way you can judge if the amount you are intending to bid will give you a good return. The more optimisation settings an ad network offers you, means that you can really target your campaigns and not waste impressions and click opportunities. You can really play with targeting features to fine tune your campaign to reach quality traffic. But targeting can also help you widen your reach! For example, lets look at language targeting. Say you have a campaign aimed at the French market, instead of just bidding for French traffic why not also bid on French speaking Belgian and/or Canadian traffic? You will be able to reach a broader number of users that you may not have considered before. No one likes to work with just anyone! So, choose the best ad network that suits your needs. Investigate, ask around on forums, see the volumes available and the targeting/optimization options offered. A premium RTB platform may be a bit more expensive at first sight, but in the end, it will always be more profitable as you will be accessing a premium service. Not only will there be more quality traffic available but the platform itself will be much better developed. Give RTB time. Not only do you need to learn, but the ad network’s system also needs to learn your campaign and understand how you are bidding, on what you are bidding, your banner rotations, etc. Then the platform will use it’s powerful algorithms to determine your best options, so patience is needed before making any big decisions. Only scale up your spendings after analysing the results and knowing that those are the results you are looking for. Managing an RTB campaign can be very laborious but in the end it will pay off. It’s not just about investing money in the right channels but also about investing time in analytics, making tests, building up your traffic and knowing what that traffic will react to. Nurture your campaigns as though they are your babies and success is guaranteed!